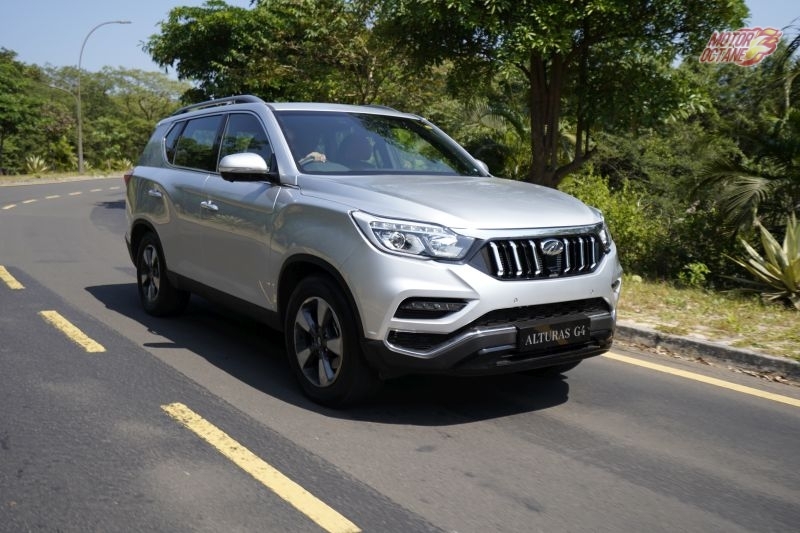 Mahindra Alturas G4 is an all new SUV that has made its way into India. This was earlier called as the Ssangyong Rexton by Mahindra. 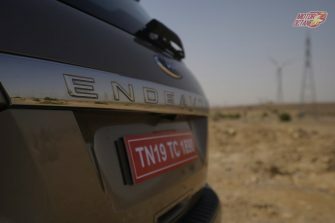 The new-generation has been re-named and re-badged as a Mahindra. The Indian utility manufacturer invited us, first to Amby Valley to drive it and then to Jaipur for a quick off-road experience. 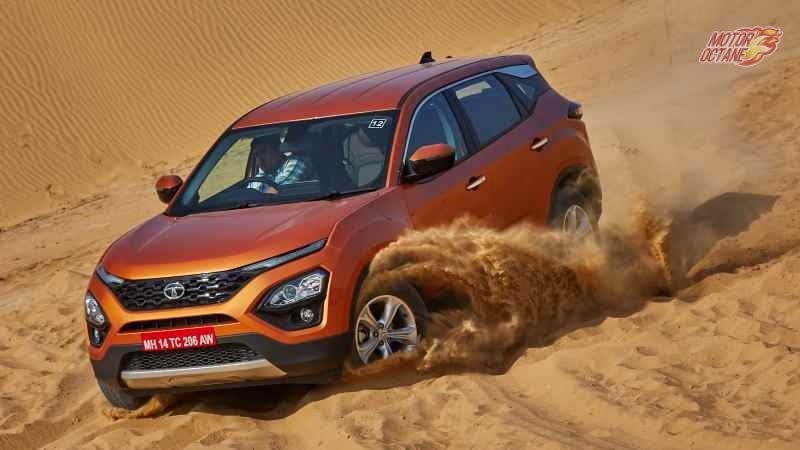 This is an all new SUV that has come to India through the CKD route. So, how good is the SUV? 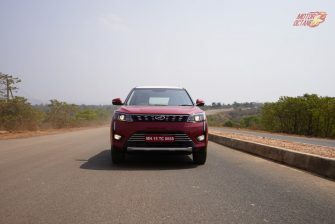 We share our quick review on this new SUV. The exterior styling of this new SUV is good. 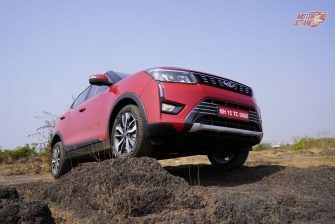 Mahindra has given it a brawny front end. 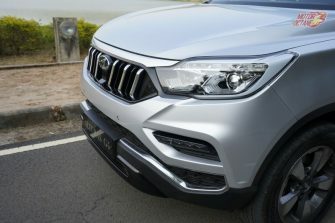 The front gets the signature Mahindra front grille with chrome, there are HIDs too with daytime runnings LEDs even on the fogs. The lower variant gets projector lights instead. From the side, it looks boxy and bulky. There are roof rails, 18-inch wheels and even a thin chrome insert of the vehicle. 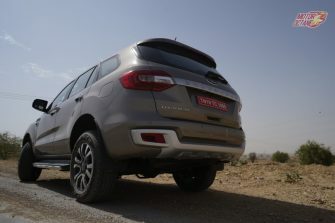 The side profile displays the massive ground clearance that the vehicle possesses. The rear looks a bit different from the rest of the sides. The thin leaf-like tail lamps look different, but the entire package has been well put together. There is minimal use of chrome on the vehicle and the styling is spot-on. For those looking to step out of the car, this will be an exciting product to consider for the Indian car market. On the inside, the dashboard does feel premium. It gets leather on the dash along with nappa leather seats. 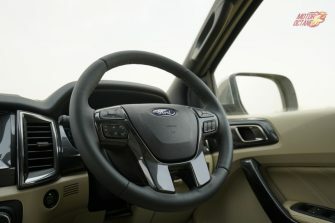 The steering wheel gets controls for audio and cruise. Apparently, the cruise control doesn’t have anything mentioned on it. On the inside, the other first-in-class features are ventilated seats, 360deg camera and even nine airbags when compared to its biggest rivals. The Skoda Kodiaq has two of them not all. 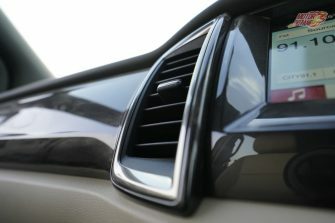 The other features on offer are touchscreen, dual-zone climate control and coloured screen for driver information system. 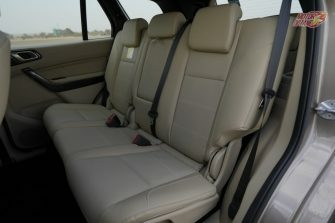 The seats are supportive and offer good space, and the same goes for the second row too. 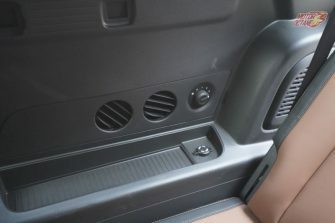 The rear AC vents are on the floor only and three can sit abreast. Second row passengers even have 12V charging socket. The third row also has good enough space and it is decent enough for 5’7″. The boot space is also decent and the third row seats fold flat. 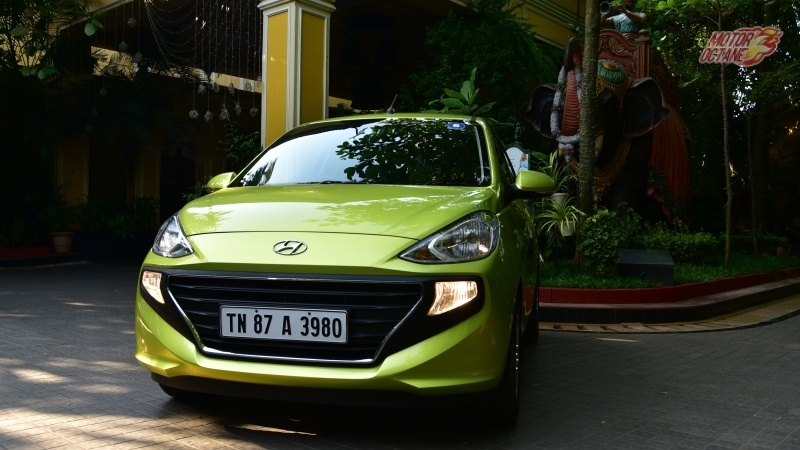 The 2.2-litre engine on offer provides good punch and it has good enough performance too. The new engine is a Daimler one and is currently available in diesel only. This churns about 180bhp of power and comes mated to a seven-speed automatic transmission. This oil burner has been made available with 2WD and 4WD options. This makes it an exciting offering for the Indian car market. The engine size is small, but the power it churns is similar to the bigger engines of the competition. Even the power they produce is fantastic. The overall engine power is good and even gear shifts are smooth and quick. The steering wheel is light in the city and as the speed goes up, it does weigh up nicely. In terms of handling, we didn’t get to experience it a lot but it did feel good. So did the ride quality also. As a complete package it is a great option to consider. We reckon this is one of the best options to pick up as it is about Rs 35 lakhs (on-road) about Rs 6 lakhs cheaper than the competition. I’m from delhi and also one of your youtube subscriber your information about 4 wheelers and 2 wheelers is very good & the way you show it is fun we enjoy your videos keep going with your work and keep watching #motoroctane. 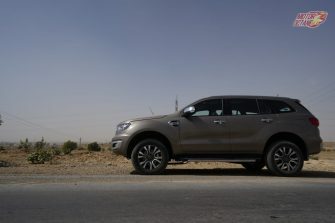 The Ford Endeavour is one of my favourite SUVs on sale today! It might be yours too. Nothing says that – ‘I will have my way in traffic’ than sitting in an Endeavour and being almost one floor above mere mortals. The Ford Endeavour is the car that will take you to the shops, do the school run, will look good in a hotel lobby and at the same time if you let it open on a long journey and it is one of the best highway cruisers that can go cross-country, smashing one state after another. 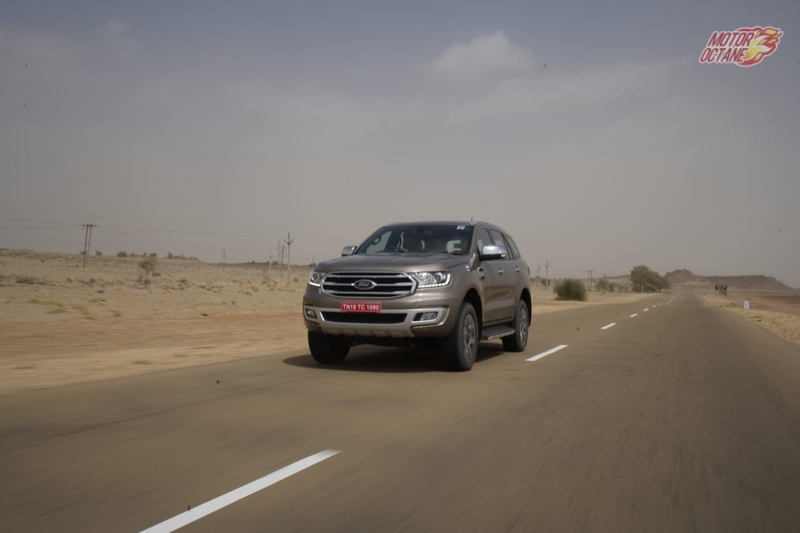 And when it comes to going off-road, yes the Ford Endeavour might not be as dope and nimble as the Toyota Fortuner according to some and we have done a video where both these cars have gone off-road head to head – click here to see that. I think off-road merits and road manners of a car go hand in hand and the Endeavour has both. 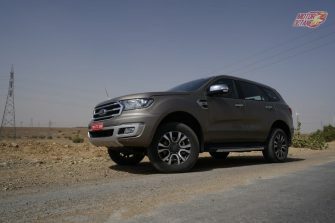 Now let’s talk about the 2019 Ford Endeavour for what it really is. The car is a facelift. Its specs have not changed at all. The car continues to get two engine options. The 2.2-litre and the 3.2-litre engines continue. Yes, there will be no 2.0-litre with EcoBoost as thought before. There will though an option for a manual gearbox for the 2.2-litre engine with the Titanium option. 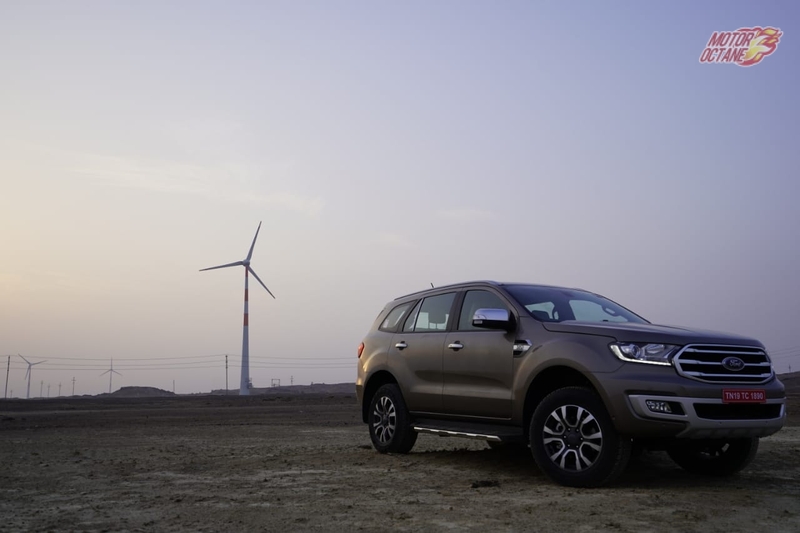 So with minimal changes and an addition of a few features, what does the Ford Endeavour have new on offer? Well in this review we will go over that. 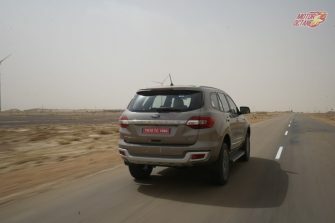 Also at Jaisalmer, we drove the 3.2-litre variant of the SUV which is unchanged and have experienced many times before but I’m eager to find out how the 2.2 manual would be. That’s for another time. 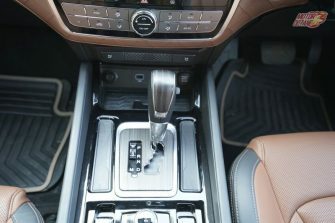 Do let us know in the comments if you would like us to review the Ford Endeavour’s manual gearbox. I could describe this car using big words and make a big deal of it being butch, handsome and an absolute freak for a sight on the road. But I won’t do that. Because you and I already know what kind of intimidating persona this car exudes. To sum up the exterior, the car gets slightly redesigned bumpers and the headlights get a smoked effect. The chrome plated bold trapezoidal grille is also new. 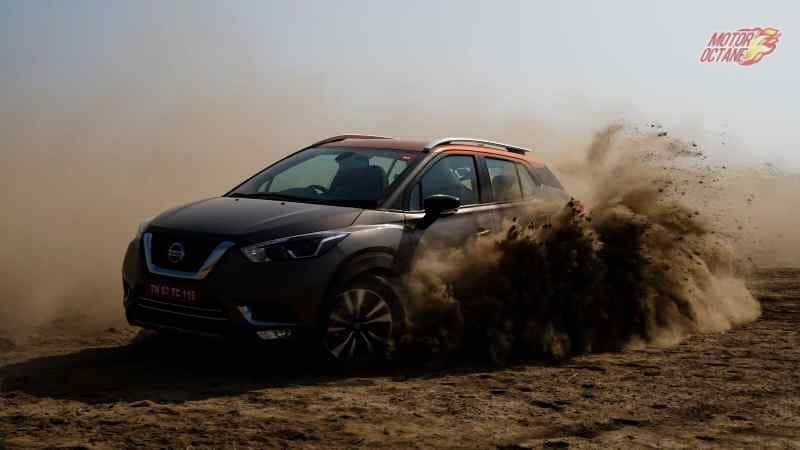 Both rear and front bumpers have integrated skid plates to protect the car’s underbody even in off-road conditions. The ORVMs feature puddle lamps make it easier for drivers to get in and out of the vehicle in the dark. 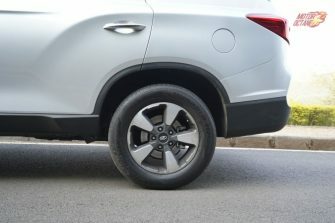 The car also gets a new design for its alloy wheels. The beefy 18-inch tyres continue. We do know that in the aftermarket, a size bigger on the Endeavour works too. Apart from all this the side and rear see no changes. The new Endeavour does get a new colour, in the form of Diffused Silver which is the car shown here. Other colors include Sunset Red, Diamond White, Absolute Black and Moondust Silver. And that’s it. That’s what you get as a facelift to the exterior of this car. Doesn’t sound impressing but do continue reading. Now that we are done with the largely same exterior, let’s move to the interior where many things have changed. The first thing I like – the new dual-tone upholstery. Did the tri-colour upholstery look like it was trying too much in the pre-facelift Endeavour? It did to me for some reason. This just looks uniform, smart and well integrated. The SYNC 3 interface looks nice and it’s cool to see it in an avatar where it’s not presented on a floating touch-screen. The instrument cluster is good with a lot of information and the speakers too are very good. Now let’s talk about the buttons! A lot of them are on this car. 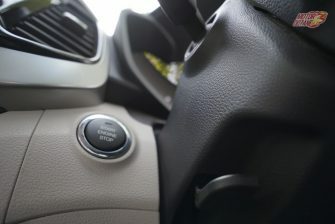 Some complaints still voiced are that the number of buttons that are still littered around this car should have reduced. And while I can see the point of that, I can tell you one thing, once you get used to the functions each provides. 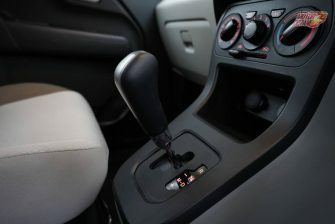 The off-road modes, the diff locking and Traction Control off buttons are all scattered in a small region of the car. But the overall interface is very good. It’s easy to know once you get used to it by which I mean to say, you won’t parallel park while trying to switch off the traction control. The buttons are fine. 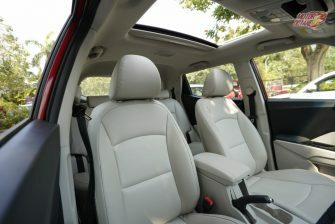 The seats are comfortable and features like the push-start-stop are a welcome addition. An extra knee airbag for the driver is there too. 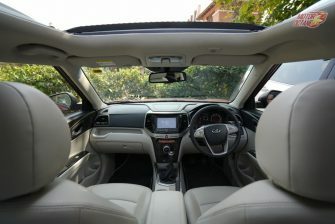 The New Ford Endeavour also gets a panoramic sun-roof, covering up to 50% of the roof space. 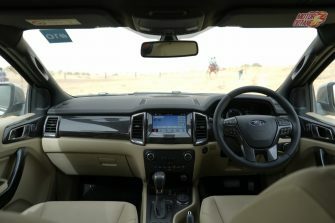 The practical interior design in the New Ford Endeavour continues to offer flexible seating and cargo arrangements – including fold-flat second and power-fold third-row that instantly flattens at the touch of a button. This is good. The only complaint that continues in the interior is the lack of space in the third row. It is advisable to only use it as a five-seater at any given time except when you have children and they can be seated in the third row. Well, whats changed? Nothing! Yes, this is becoming a dull review. But when the same car drives exactly the way it did before and it has exactly the same handling characteristics as before you have got to bear with me. It’s often said – ‘If it ain’t broke, don’t fix it’. 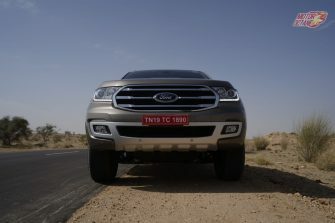 This is what the guys at Ford India have done exactly. You might ask why no 2.0-litre engine! Why? Because the 2.2-litre manual is good enough. And coming to the 3.2-litre, this thing is as wonderful as Game Of Thrones being renewed for 8 more seasons. 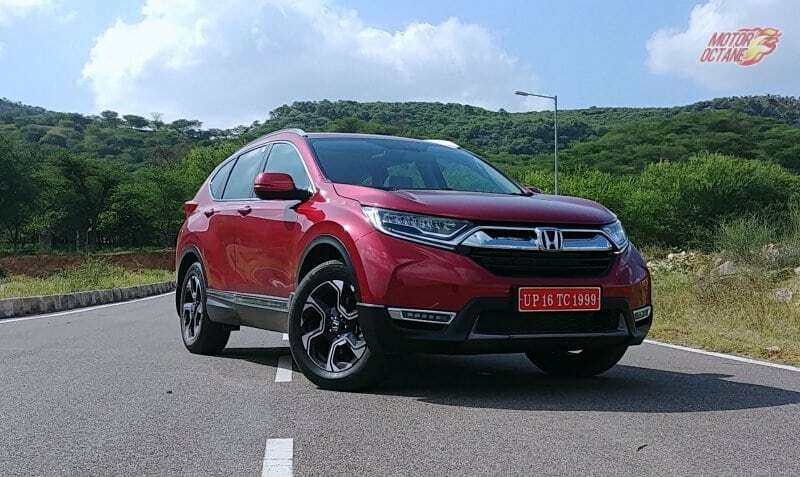 It’s the biggest engine of its class (also the most thirsty, but I love it) and when you are on an open stretch of road with your foot down, the five-cylinder diesel quickly puts you in triple digits territory, you know it’s all worth it. And if handling for a big SUV needs to be discussed, let me tell you it’s way better than the Toyota Fortuner or the Mahindra Alturas G4. The body roll, though present is not as pronounced as the other two. 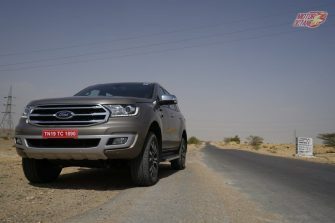 The ride too is superb as I remember driving on a single lane road in Jaisalmer, racing to catch a flight in the Endeavour. I loved the fact that the car was not shy of suddenly leaving the tarmac for the barren and rocky patch of land running alongside (we ended up reaching before our plane had even landed). 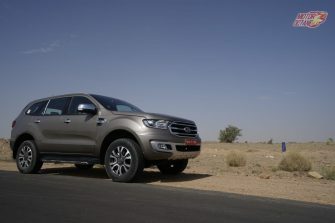 That’s the most you will use your Ford Endeavour off-road. Using the ground clearance and power to meet deadlines! That’s the best reason to own an SUV in the city for me at least. So finally, the verdict. Nothing is new when it comes to the specifications. The addition of some features has made this a better deal. So should you buy it? Yes! My philosophy with mid-life facelifts is simple – ‘Give us something more and sweeten the deal’. And with the price announced today, that’s what happened. 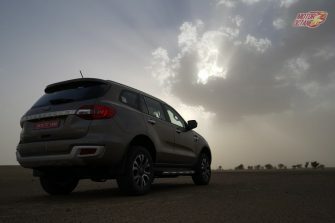 People might say a Toyota Fortuner is better at off-road, it’s an all-rounder and I will after some convincing agree. But you have got to drive the big Ford and forget that nonsense about off-road. The Endeavour has more features for you to play with, the engine noise is cut off by the Active Noise Cancelation, the thing can park itself, it’s not bad in the city too (most lesser mortals move out of your way) and when you are in the mood for adventure, the 2019 Ford Endeavour is ready to take on continents. 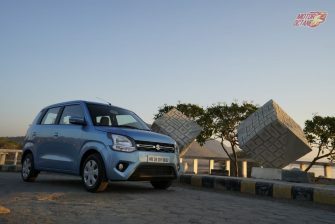 The Maruti Wagon R has been one of India’s top selling cars for a very long time now. The car is widely used in the commercial sector and has been a trusty steed for those who are first time buyers. Many swear by the cars no-nonsense approach to motoring and the immense amount of practicality it has on offer. 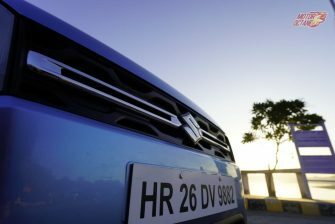 So what has changed in new generation 2019 Maruti Wagon R? A lot. This is no longer a car that we are now used to seeing in the traffic as an Uber or something that is going annoyingly slow in the first lane of the highway. The 2019 Maruti Wagon R is here with a host of different updates and new features. It is different from the Wagon R sold in Japan. It is built for India, by India. Maruti has engineered and built a car that is specifically for our country, road conditions and customer needs. The new Wagon R is also based on Suzuki’s latest Heartect platform. Benefits of the new platform are better dynamics, overall lighter and improved overall safety. The Heartect platform also results in more space in the cabin. 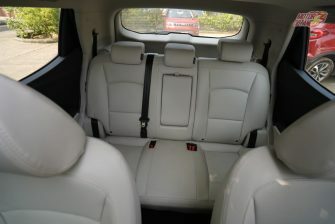 The new Wagon R is wider longer and has got more legroom and knee room than before. 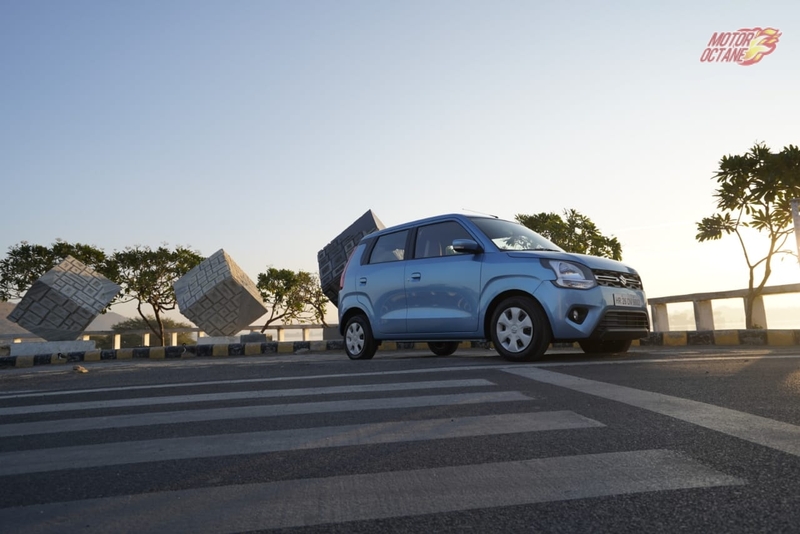 The car shares most of its dynamics, proportions with Maruti’s NEXA offering, the Ignis. 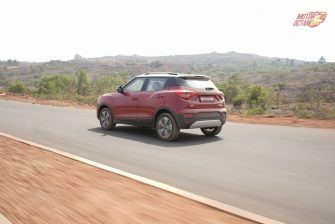 Along with the new platform the new Wagon R continues to get the old 1.0-litre 3 cylinder engine that makes 68bhp and a new much powerful 1.2-litre engine four-cylinder K12 engine. 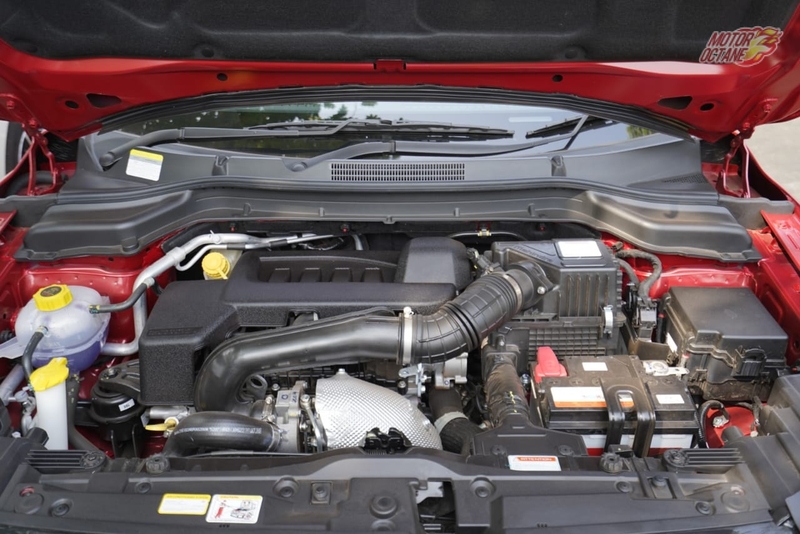 The option of the 83hp engine is in response to the demands of customers wanting more power in the Wagon R. In terms of safety now, the car now comes with ABS and EBD as standard across all variants. 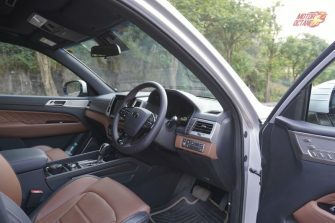 Also standard is the driver side airbags, seatbelt reminder for driver and passenger, central locking, rear parking sensors, speed alert system and child-proof rear door locks. With the overall length of 3655mm, a width of 1620mm and height of 1675mm, new 2019 Wagon R is certainly bigger. Maruti has designed the car to give it a robust look. 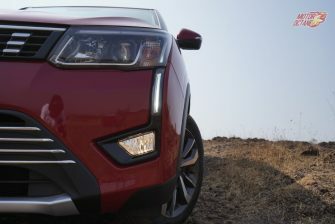 At the front, the car gets new headlamps which are a departure from the square like headlamps that are seen on the older Wagon R. The headlamps are a unique dual split unit which will make the car look more modern. Could Maruti have offred DRLs and projector headlights on this unit? It would have been a segment first and a really good premium feature to have. But as we know manufacturers like to save features for a facelift and if the Baleno has just got them now, so could the Wagon R and Ignis in the future soon. The car now gets a modern architecture chrome grille. There are new lines on the car too. The bonnet and the side carry these distinctive lines which make the car look bigger and better. On the side, we also see a new design element on the rear, C pillar. The design looks like the car has sideburns on the rear and is also a little bit more distinctive. 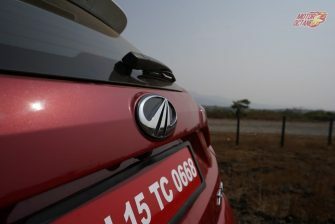 The rear has a very sculpted look with the big new taillamps which look like they are inspired by the new Ertiga. The chrome strip on the boot now carries the name WagonR on it. The first thing that one experiences when entering the Wagon R is the amount of space available. The car has now got more space than ever. The ingress-egress is the best on the Wagon R and this only gets better on the new car. The cabin feels airy and the large glass area gives one a great view out of the cabin too. The cabin itself now looks better and gets a dual-tone black-and-beige theme upholstery. 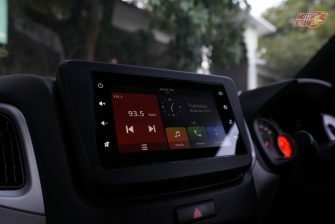 The new touchscreen system which is the new Smartplay Studio – 17.78 cm Touchscreen Infotainment is good and gets a really nice UI. Paired with this new touchscreen, one gets Android Auto, Apple CarPlay, USB/AUX controls and Steering mounted controls. This system also offers AHA, an internet radio service. What is really a let down is the 2 speakers that come with this system. A couple of tweeters added or a four-speaker system would have been ideal. 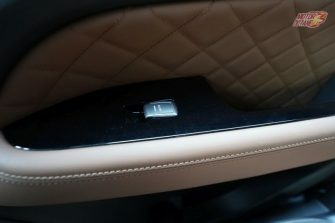 Also, the car now gets power windows as standard and comes with Auto Down function for the driver side. Under the touchscreen, we get the AC controls, which are a manual unit and is fairly simple to use. There is also a charging socket underneath and storage space. Storage is not a problem with all door easily accommodating 1-liter bottles each and a unique storage solution with an undertray on the co-drivers side. Practicality has been the Wagon R’s key offering, and the new model only improves in this area. Boot space is now 341 litres, this makes it more spacious than the Vitara Brezza. Except for the base variant, the seats split 60:40 which make for more storage. Some drawbacks at the rear are that the loading lip is a bit high and parcel tray does not have strings so that it can tilt up when the boot is opened. 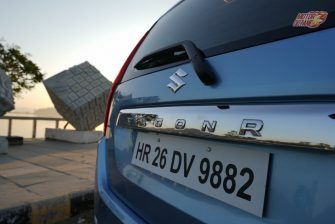 We experienced the 1.2-litre engine in the Wagon R with it’s manual and AMT variants. The 1.2-litre engine has already proven itself as a good engine in the Baleno, Ignis, Swift and DZire. The 83bhp engine on the 845kg car feels more than adequate. The gearshifts are very smooth have no problem at all. This new engine in the Wagon R loves to be revved and surprisingly picks up speed quickly. The wider track of the Heartect platform have improved stability and handling too. Straight line acceleration is liner and the car does not mind being in the 5000-6000 rev range. While there is no strain on the engine and the car feels like it has more to give after the mid-range powerband is over, at the top end this car is noisy. The tyre noise and high revving engine combination make for a noisy cabin. Noise insulation can be a bit better. Also we can see the lack of grip with the 165/70/R14 tyres. They are great tyres for economical drives, but push them to fast in a corner and the little wheels do feel like they are on the edge of grip. The new powerful engine and the manual gearbox do make for a very enjoyable drive. 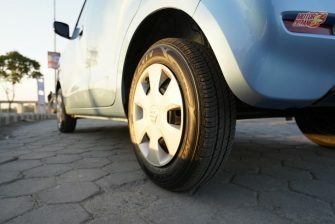 We do think that a larger and wider set of tyres will make the car a bit more engaging and better. Thoughts on the AMT? Well, this will be loved by city-dwellers and while it is not the best AMT out there it is a good unit. The upshifts are slow and the car tends to be stuck in the lower gears before making its mind to shift up. This can easily be solved with the manual mode at your disposal. The gearshifts are much more responsive now and your control over the gear selection is now maximized. Our final verdict for this new Wagon R is a bit unorthodox. We have spoken about the 1.2-litre engine that we experienced. But given the price of the 1.2-litre engine and the features one gets at the price point it’s a very expensive deal. What a Wagon R owner is really after is efficiency, practicality, and the best Value For Money deal. Because of this, the car that we would recommend is the Wagon R 1.0-litre. The 1.2-litre with the Zxi variant is not going to offer a lot more features than the top-end Vxi variant of the 1.0-litre car. The VXI AMT makes a lot of sense. 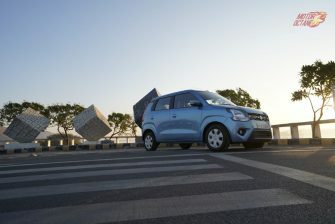 It gets the space, the efficiency and for everyday city driving, it’s an excellent choice. 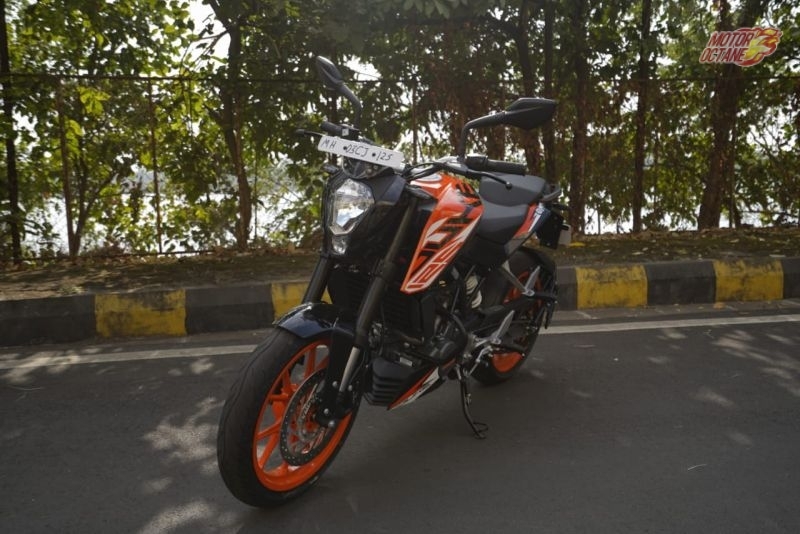 KTM Duke 125 is an all new Motorcycle and this the first time, Indian audience will experience a 125cc mill from the Austrian maker. 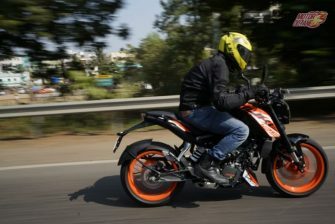 KTM has been known for its performance, riding dynamics and even handling. What does this new bike have on offer? Does it live up to the KTM name? Should you even consider it? Is it worth your buck? We find out more about it. If we look at the bikes design, there are a lot of things that work in it’s favour. The styling is the same as the Duke 200. Of course there are three colours – White, Black and Orange. 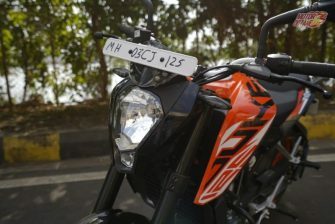 The fuel tank reads Duke 125. This is the only major difference. The fascia gets the regular yellow bulb. No LEDs. The export model gets the same Duke 390 headlamp with split light and LEDs. 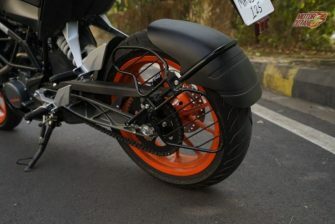 The front has USD 43mm forks. Front gets 17-inch tyres with 300mm disc brake and single channel ABS. Single channel means it will avoid lock up for the front only. The alloys are orange colour. Moving to the side profile of the bike, the fuel tank has chiselled look. Fuel tank is 10.2 litres, which is a tad small. There are a lot more things to showcase. It gets a split seat and the seat is narrow, so even short passengers can sit comfortably. The rear seat is higher and is just fine for a pillion for a city ride. Long journeys can be tiring. The tail lamps aren’t different from the other Dukes. 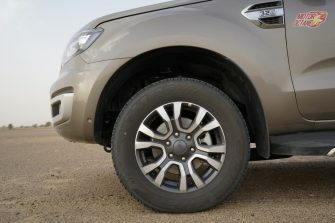 17-inch wheel at the back and 230mm ground clearance too. It also gets an RMP this time. When you get on the bike, you realise the seating position is very comfortable. There is no problem even if you head on a long trip. The 125cc engine with 13-odd bhp has linear Power. It can compete with almost any150cc commuter bike. In terms of power on paper it is about 160cc engine. 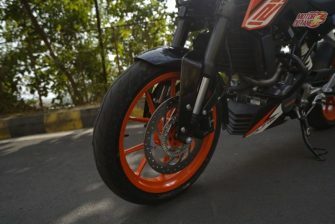 Now, Duke is known for its sudden spike in torque which gives it a kick. With the Duke 125, it isn’t the case. The bike is very calm and comfortable. There is more than sufficient power and torque but it doesn’t get the kick. 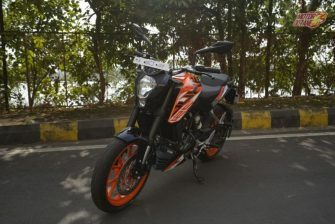 The Duke 125 has very linear power, which is good for daily City riding. But if you need to overtake that is where you might struggle a bit. The engine is refined and has a good exhaust note. The pipe is placed on the underbelly. In terms of power, the bike could have have had more, but for the segment it’s targeting – we reckon this should be fine. In terms of ride and handling, the Dynamics is well sorted for this bike. The ride quality is also fine and the bike is easily chuckable. 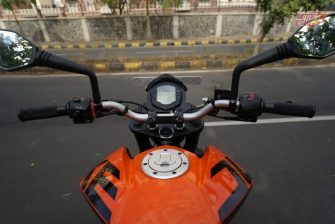 The mileage should be close to 40-45km/l as the bike doesn’t encourage you a lot to push but it’s nimble nature means you won’t even want to go slow. 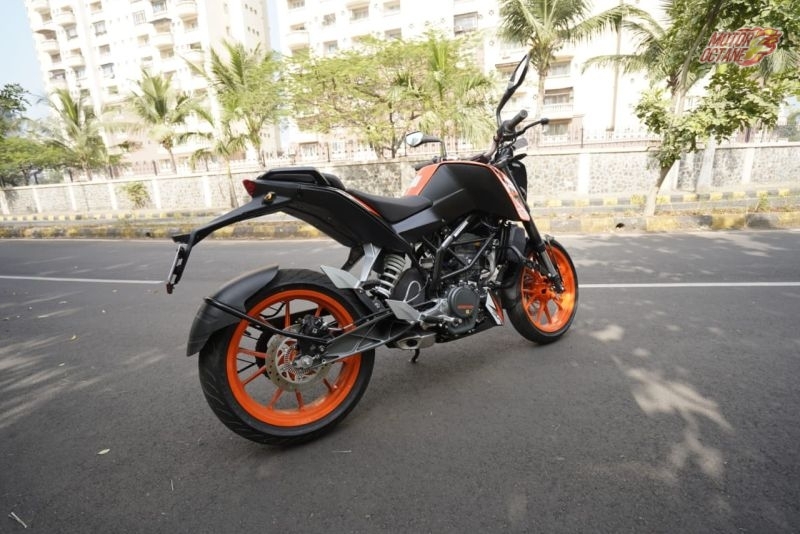 The biggest question is at Rs 1.46 lakhs (on-road) is this a good bike to buy? 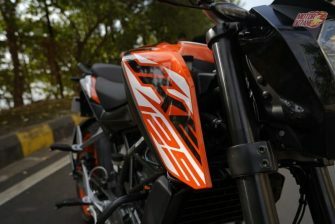 If you went KTM badging and something that is comfortable and still nimble – this should be the choice for you. 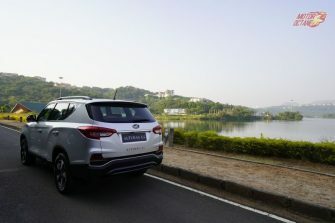 Here is an in-depth video review of the Tata Harrier. 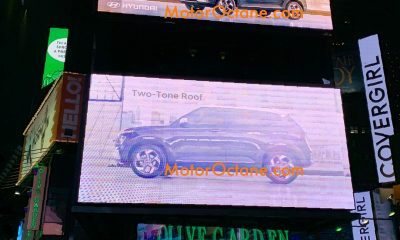 This is an all new SUV that is based on the Land Rover platform. This comes with 5 seats in total and it offers a lot of bells and whistles. 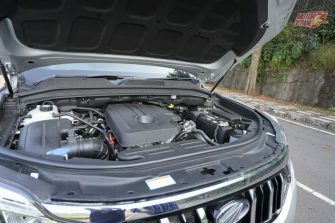 It has a 2.0-litre diesel engine with manual transmission. There is no petrol or even a diesel automatic on offer. Only a 4×2 on offer, while the ESP comes with multi-modes to avoid slipping. There are several new features on offer and it gets a lot of data on offer. 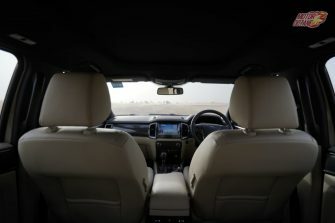 In India, high seating cars have become the preferred choice. This holds true for the SUV body style. When things move to the MPV design, for Indian market it hasn’t been a great story. Except a few select, others haven’t done well. Look at the Toyota range, first the Qualis, then the Innova and now the Crysta. There has been an increase in the price tag with a lot more on offer and customers have appreciated it. The other MPV that has been successful so far is, the Ertiga. So far, the first-generation has been a runaway success and the second has just come in. 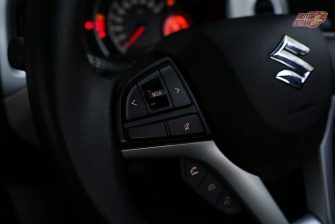 Maruti has played it safe and got it at a similar price point. Of course it is bigger and wider than before and does have something new on offer. The pricing of the new Ertiga is between Rs 7.44 lakhs and goes upto Rs 10.90 lakhs (ex-showroom). This gets a new engine in petrol but the CNG option has gone missing. So, what are the features that new Ertiga offers? Is it worth a buy? We share all the details with you. The new-generation Ertiga sees an increase in length of about 100mm and 40mm in width. 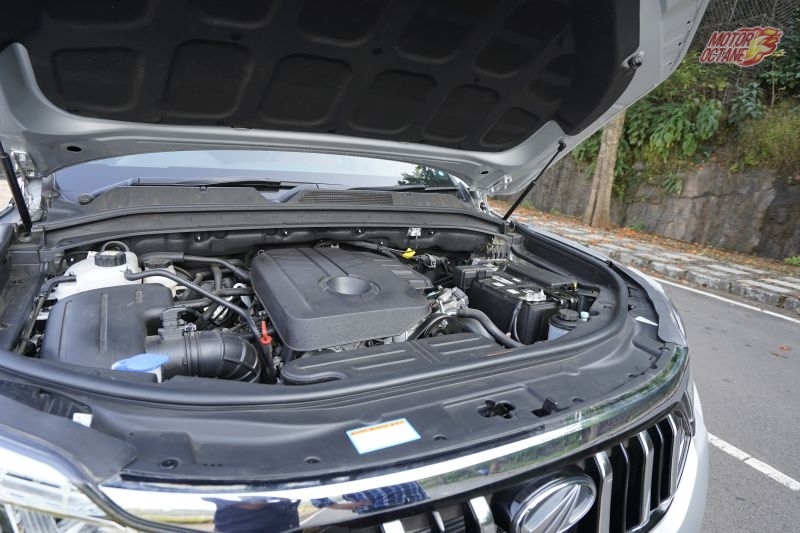 The engine compartment has seen a reduction in its size, which makes the in-cabin area larger. The fascia sports a new chrome front grille, never seen on any other Maruti product. The headlamps are projector lamps. There are no daytime running LEDs, and regular fog lamps. The bonnet looks stylish too and it does have its strakes too. Many wil say it does look like other stylish MPV. The side profile of this vehicle very MPV-ish. The rear door size is bigger than the front, indicating more room inside. The wheel size is still 15-inch, and not any bigger. The Swift and the DZire both sport same size tyres. The door handles on the higher variants are chrome and no roof rails on offer either. 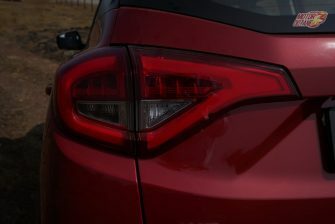 The rear gets stylish tail lamps and many new cars have a similar approach to the design language. It looks good on the Ertiga and makes it look bigger than before. The new MPV is certainly bigger and feels a lot more premium. 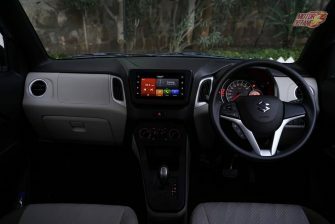 On the inside, the Ertiga gets an all new dashboard. There is beige and grey interior with wooden inserts. At first glance, one can believe that the left AC vent runs from the left AC vent to the m touchscreen tab. The steering wheel is flat bottom and it is grey in colour. On the top model it is leather wrapped and gets wooden inserts too. 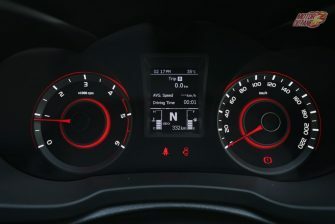 The instrument cluster gets twin dials and driver information system in between them. The information system offers some cool graphics and data on it. Center console gets touchscreen system only on the top model. There is Android Auto, Apple CarPlay, reverse camera on offer. But the automatic doesn’t even get this feature and even no leather on the steering. There is climate control on offer too. One interesting feature is the cooled cup holder, an innovative feature for this segment. The front row seats are spacious and it offers Good support too. As a product, it offers Good knee room and head room. The side and back support of the seat contour is fantastic. The second seats also offer good space. These seats offer sliding and recline option. AC vents are mounted on the roof. Arm rest on offer and only two head rests. Here three large adults can sit abreast and seats come with 60:40 split. Passengers here have 12V socket available to charge too. The third row offers good space and support too. There is recliner on offer and adjustment for the headrests. Only two passengers can sit here. Third row is surprisingly offering better knee room than most of the vehicles in this segment. For tall passengers, head rest is a bit too tight. Boot space is sufficient for about three suitcases. The new 1.5-litre engine on offer is mild hybrid. This mill churns about 103bhp of power and comes mated to a five-speed manual transmission. This is an all new engine that was first seen on the Ciaz 2018. Is it any good? The car gets a new 1.5-litre petrol engine and a new micro hybrid system in the form of SHVS. 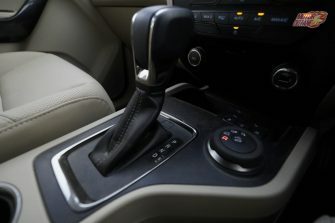 There is an option of a manual transmission and automatic with the petrol. The 1.3-litre diesel doesn’t get a automatic transmission. The Ertiga’s exterior is now more aggressive. The headlights now get projector bulbs and the tail light has LED strips. The cars also does get a better glass area in proportion to the overall mass. The 15-inch tyres on the car come with alloy wheels and steel wheels in the lower variant. 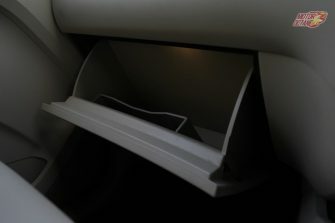 The cars interiors have been updated too. Wood now makes an entry into the cabin on the dashboard. A new feature for this car is it’s cooled cup holders for the front row. The car gets new fabrics. The infotainment system and instrument cluster are also new. The space in this car has also increased. The overall width and wheelbase has also increased. So the second and third row with the boot have more space than the previous generation Ertiga. 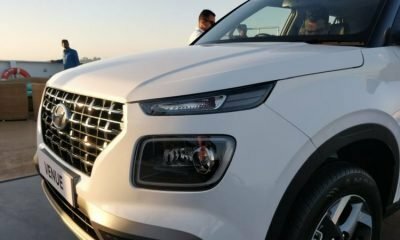 The car will go up against the Mahindra Marazzo and also aim to poach some customers of the king of MPVs, the Toyota Innova. There was some disappointment that this car did not come with a diesel variant; nor did it come with a diesel automatic variant. These non-existent variants do make a certain amount of buyers look for other options. With prices staring at Rs 7.44 lakh (Ex-showroom), the car has already received over 10,000 bookings. But how does it drive? And should you consider this car as your next MPV? Check out the below video to find out. The two band new MPV rivals are finally going to face off! The launch of the 2018 Maruti Ertiga is something the 2018 Mahindra Marazzo must be waiting for. 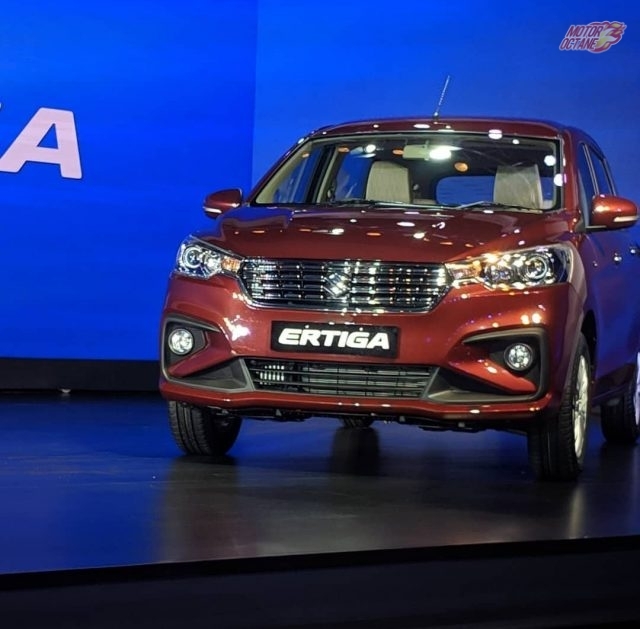 This is a serious segment where the Ertiga is a veteran and Marazzo has to face the newest version of the Maruti Ertiga, which is going to come charging at full tilt. 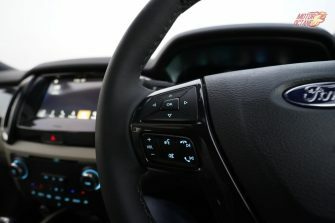 The Marazzo showed the world that Mahindra could make a unique car with a completely new design and a host of new features. The Maruti Ertiga on the other hand comes with a lot features standard features from its base variants. 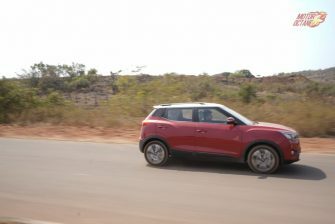 It also comes with a petrol engine which will see a lot of bookings. 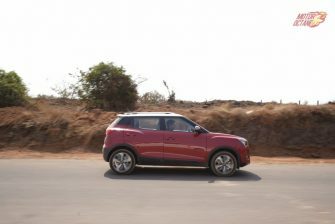 The Mahindra has the size advantage and also gets stuff like four disc brakes on all variants as standard. The fight between these two is a close one. Let’s break it down with the below comparisons and tables to find out more. Firstly we have to talk about design, the cars exteriors. Let’s talk about the Maruti Ertiga, which has entered this segment with its latest iteration. The car has certainly gotten bigger than the previous generation but it’s nowhere as big as the Marazzo. The front continues to have the cab forward design and has now adopted a more family friendly design language in comparison to the shark inspired, aggressive look of the Marazzo. The Mahindra Marazzo does look more appealing at the front than the Maruti Ertiga. 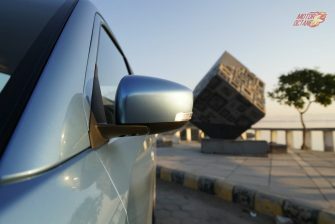 The side is where I can say that the Ertiga redeems itself. 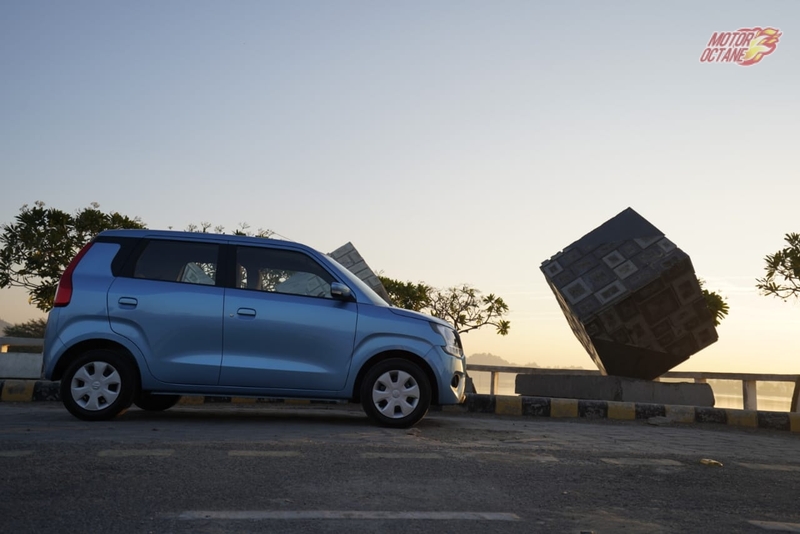 The Marazzo is based on a ladder on frame chassis and thus gets a tall body design, getting into the Marazzo is a little bit more taxing than the Ertiga. The Ertiga with its HEARTECK platform is more car like and has simpler ingress and exit. The rear of both the cars look great. The Marazzo with its shark elements on the taillight and bumper looks more aggressive. The 2018 Maruti Ertiga has fueled many questions of it bearing resemblance to the Toyota Innova Crysta and we can see why. The headlights with the swept back design and the rear LED taillights do big the car that illusion of it being bigger. This look could be enhanced further if the car was given a bigger set of tyres than the 15-inch alloy and steel wheels it comes with now. The 17-inch wheels on the Marazzo just make the car look better. 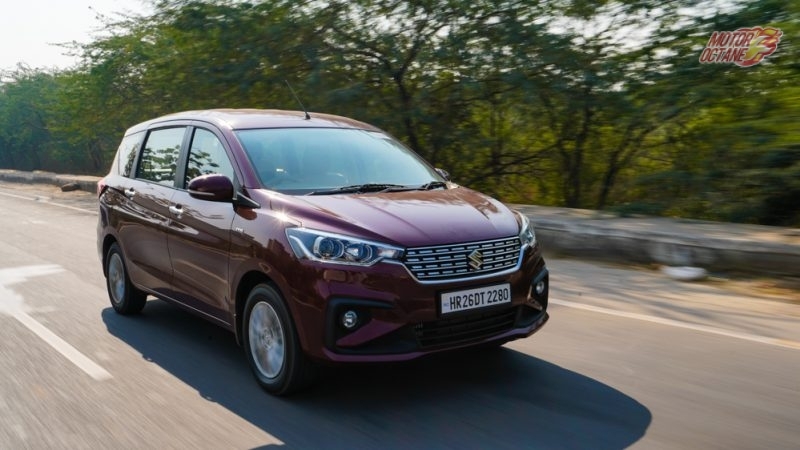 The overall winner in exterior design has to be the Marazzo but design is a subjective point and some might prefer the subdued and more traditional looks of the 2018 Maruti Ertiga. The interiors are where the Ertiga starts winning back some points from the Marazzo that it lost in exterior design. 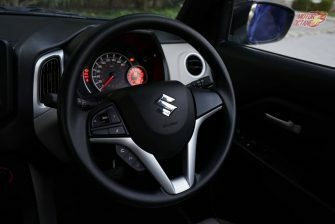 The Marazoo’s piano black interior and part leather seats can’t hold a candle to the Maruti’s plus beige and faux wood interiors. The Ertiga’s interior just feels roomier and aesthetically laid out than the Marazzo’s shiny plastic jeweled dashboard. 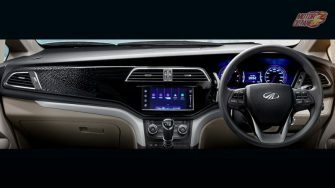 The instrument cluster of the Marazzo with its purple inserts and multiple settings display does look better; it also gets turn by turn navigation guidance. 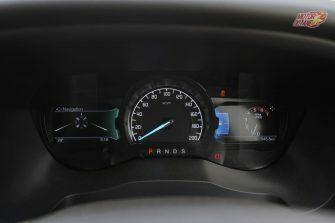 The Ertiga’s instrument cluster does not feel pale by comparison, it’s good, the dials are big, and most of the relevant information is given in the center too. From here the Marazzo start clawing back points. The Marazzo gets better visibility because of it tall design. 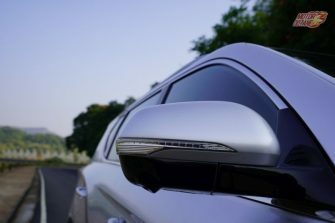 The Marazzo gets cruise control, something which the Ertiga missies out on. The second row of the Marazzo is also better. The captain seats with the amount of headroom and legroom are very comfortable. The Ertiga has gotten better but not by much in comparison to the Marazzo. The Marazzo gets a lot storage and has a large center console next to the gigantic hand brake leaver. The third row of the Marazzo is humongous with ample headroom and knee room for three adults to be comfortable for short distances. 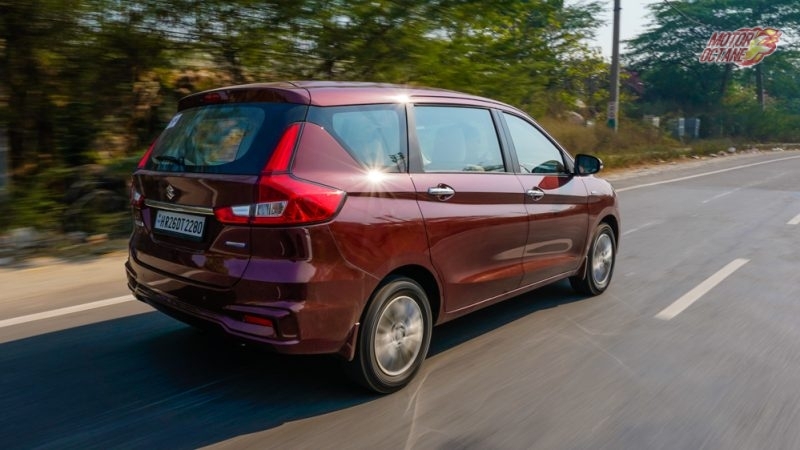 The boot space on the Marazzo is lesser at 190-litres. The Marazzo does right now miss out on Apple CarPlay. Both cars get 12 volt charging sockets and automatic climate control. 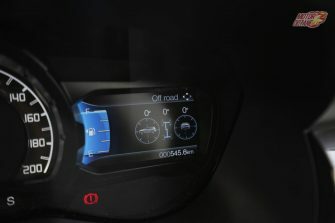 The Marazzo does get Surround Cool which extends till the third row and helps the car cool faster. The interiors of both cars can be pleasing to respective owners. 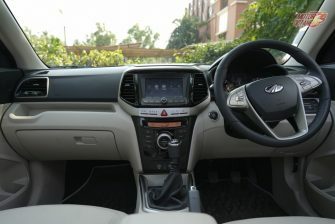 The Maruti Ertiga’s interiors are all brand new and have a richer appeal to it. The Marazzo might get some extra features but might not appeal to everyone. 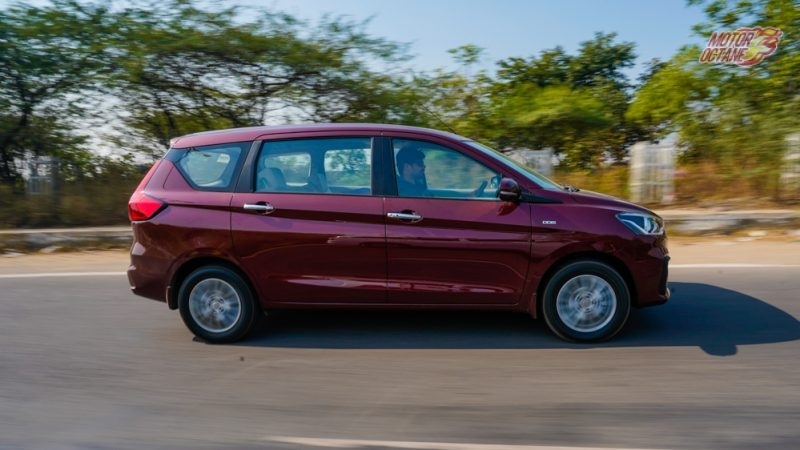 The Mahindra Marazzo is defiantly slightly bigger car in every respect than the 2018 Maruti Ertiga. And for this comparison we have to keep in mind that the Marazzo is not available with a petrol engine. Apart from that, we have to say the Marazzo till now is looking at becoming the better choice among the two. Some of stats in the below chart talk for themselves; maybe the price will change it all. The price is where the Ertiga will turn the tables around big time. The 2018 Mahindra Marazzo starts at Rs 9.99 lakh (Ex-showroom) for its M2 7STR variant and goes up to Rs 13.90 lakhs (ex-showroom) for it’s top end M8 7STR variant. The Marazzo gets a total of 7 variants. The 2018 Maruti Ertiga meanwhile gets 10 variants and starts at Rs 8.84 lakhs (Ex-showroom) for the LDi variant and goes up to Rs 10.9 lakhs (Ex-Showrrom) for its top end ZDI+ variant. The vast price gap is a real factor that will make the fight for Marazzo very difficult. Also as we speak the Ertiga has received more than 10,000 bookings already. 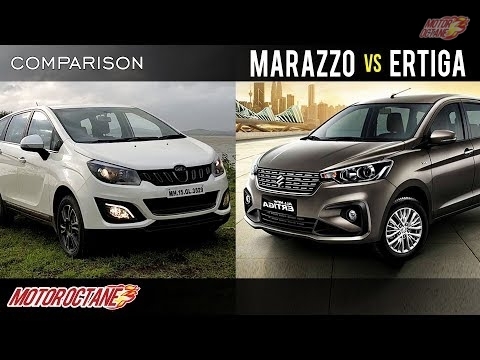 *In this comparison we have not taken the petrol version of the Etriga into consideration because the Marazzo does not have a petrol variant yet. 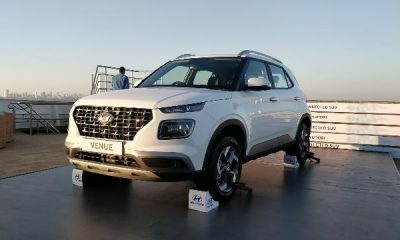 The Mahindra Alturas G4 is the new flagship SUV in the Mahindra stable. It comes with a 2.2-litre diesel engine which is paired to a automatic gearbox sourced from Mercedes. The engine makes 184bhp and 420Nm of torque. The car get shift-on-fly 4×4 too. There will be a variant with only two wheel drive called the G2. The car is essentially a rebaged Rexton with the signature, Mahindra seven slate grille. The cars not changed visually at all since the first time we saw it at the 2016 Auto Expo. It gets DRLs, Projector headlamps and LED tail lights. 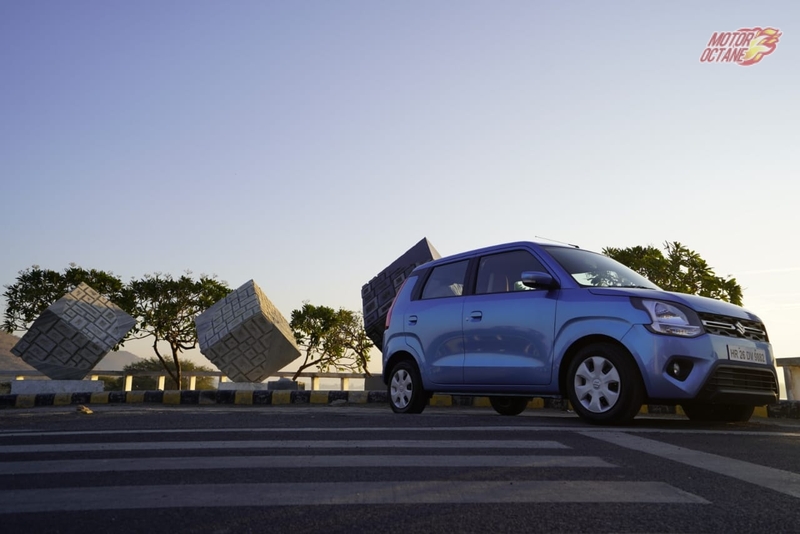 The car also gets a 360 degree parking camera; that is apt for a vehicle which is almost 15 feet long and more than 4 feet wide. 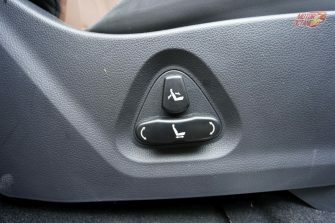 The entry to the driver seat is easy and simple with the welcome gesture that involves sliding the electronic seat completely back for easy ingress. The front driver and passenger seats are ventilated and the whole interior and other seats are done up in soft and supple Napa leather. The cars also got a brilliant instrument cluster which has navigation, infotainment and wait for it… 3 different speedomteres in case you don’t like the regular analogue. The infotainment screen is a 8-inch unit that gets Android Auto and Apple CarPlay. The 2nd row gets a armrest with intigrated cup holders. There are AC vents at back with 2 personal vents for the third row too. The cars third row is really it’s Achilles heal. it is quite litraly the worst part of the car to be in for a long journey. It is fine for children whom parents should pray got to sleep. Also the third is too claustrophobic with absolutely no glass area. 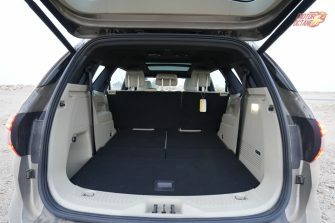 The bootspace is decent and the last row does fold flat to make the space large. The car will also gets a decent size sunroof and 9 airbags as standard which is the most in this segment. Let’s talk about the drive. First, lets put this car in reverse, and see the side rear view mirrors on the car tilt down and help one back up this giant with easy. 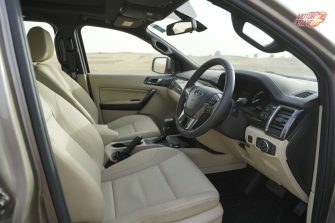 That said, the Toyota Fortuner does have a better turning radius and comes with a more agile steering wheel. 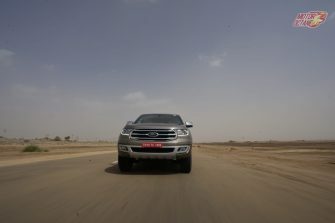 But what the Fortuner does not have is steering feedback, something many SUV owners take for granted, the Alturas G4’s steering becomes heavy in a liner fashion when one puts his foot down and around corners the steering will let you know everything from grip to the texture of the road. The ride is not compromised at all. In spite of being a big ladder on frame rig, the Alturas G4 managed to keep it’s weight in check and did not roll around to much. The nine-speed Mercedes gearbox also responded quickly under duress and down shifts before corners and upshits while hauling on straight roads were quick from the triptonic unit. The engine is always in the meaty power band of this car. 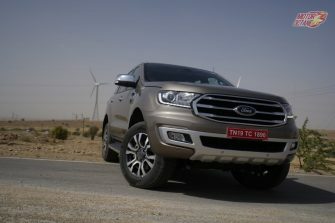 In a staight line thought we do think that the Fortuner and the Endeavor with engines having bigger displacement will completely leave the Alturas eating their dust. The verdict is pretty simple. 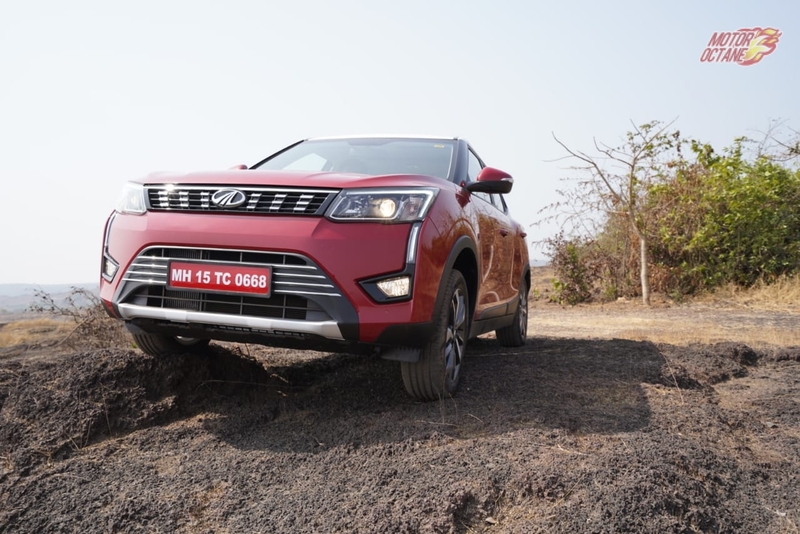 As the price of this car is yet to be released; we can only say that if it comes in Rs 5 to Rs 7 lakhs cheaper than the Fortuner, the Mahindra Alturas G4 will be a steal. 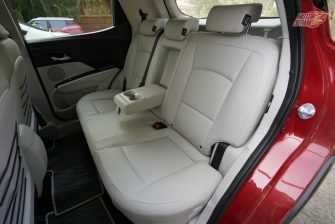 The car is built tough, the engine is refined with hardly any noise in the cabin, there is decent space on offer. We just hope its priced right. 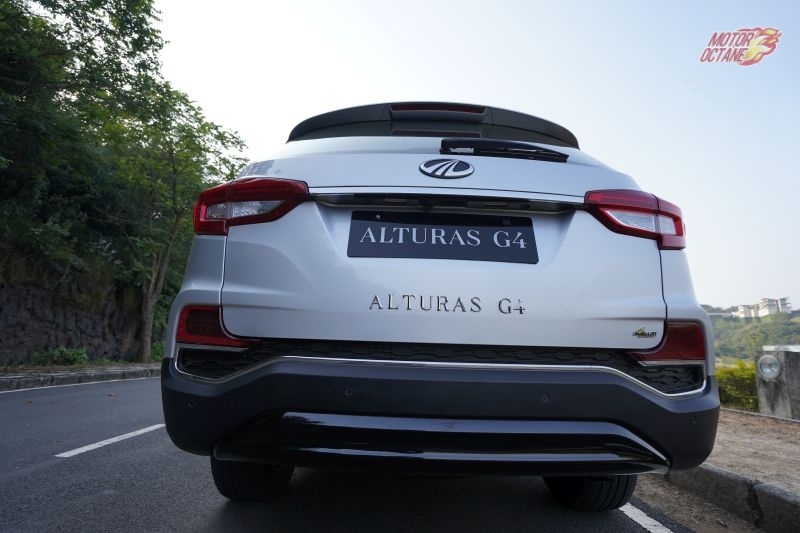 What do you think about the Mahindra Alturas G4? Do let us know in the comments below! The bike that took away Royal Enfield’s thunder a day after the 650 twins were given their respective pricing. Many Jawa club members and old owners were overjoyed and excited that their hero has been revived. In this video we take you into an in-depth walk around of the standard 300cc bike that Jawa Motorcycles is going to call just ‘2018 Jawa’. 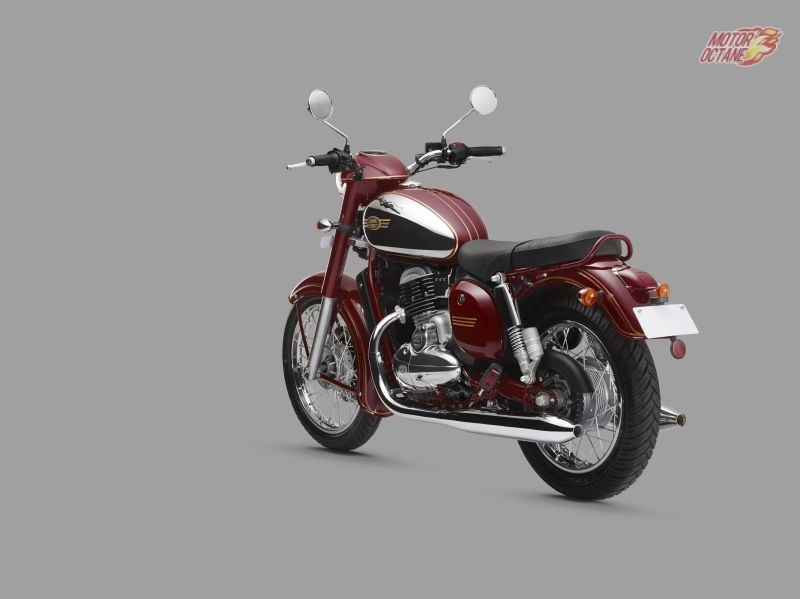 The bike is a throwback to the old classic Jawa and was debuted as the company’s flagship offering till the Perak comes into production. The 2018 Jawa shown here is finished in a color called ‘Jawa Red’ with touches of chrome around the vehicle. 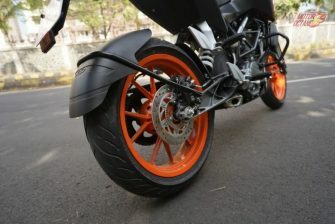 The company has brought the bike into the 21st century with features like disc brakes, DOHC, AHO and ABS. 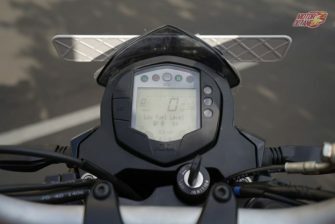 It gets an old school analogue instrument cluster and a electric starter with the option of a kick start on the right side of the bike. The 2018 Jawa gets telescopic front forks and twin shock absorbers with a gas canister at the rear. The tyers come with wire spoke wheels and are a set comprising of 17-inch at the rear and 18-inch at the front. This has overall enhanced the look of the bike and made it appear large too. 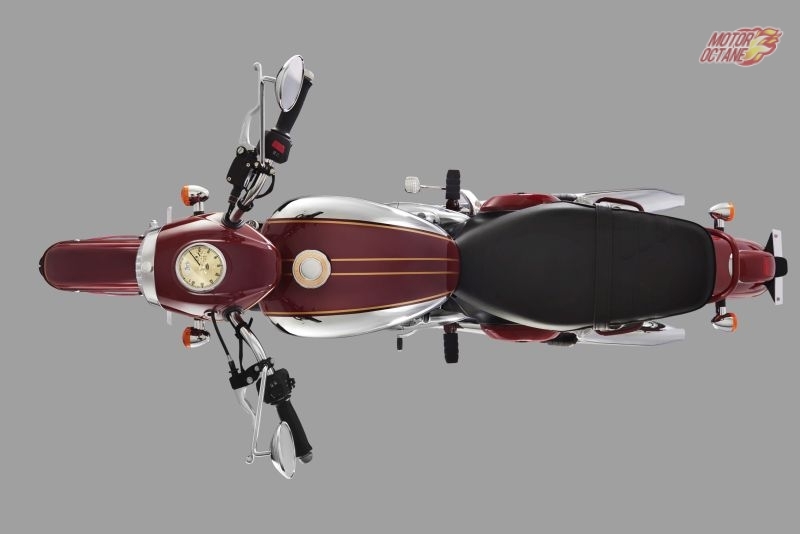 The bike also gets twin exhausts which are cigar shaped and it makes for a very impressive and retro look. 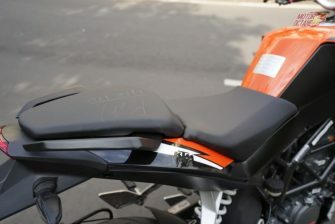 The seat gets side stitching and also a cool design motif at the rear with three slats to show it’s a Jawa. The horn comes integrated into the Jawa logo at the front under the headlamps. 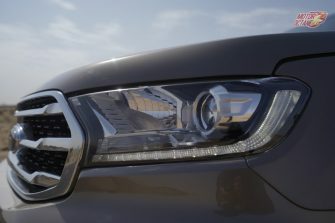 The headlamps are halogen lights with no LEDs or DRLs. Scroll below to see all of this in more depth now. The bike comes with a price tag of Rs 1,64,000 lakhs (Ex-showroom) and now do check out our below video which is the most viewed video of the 2018 Jawa online. 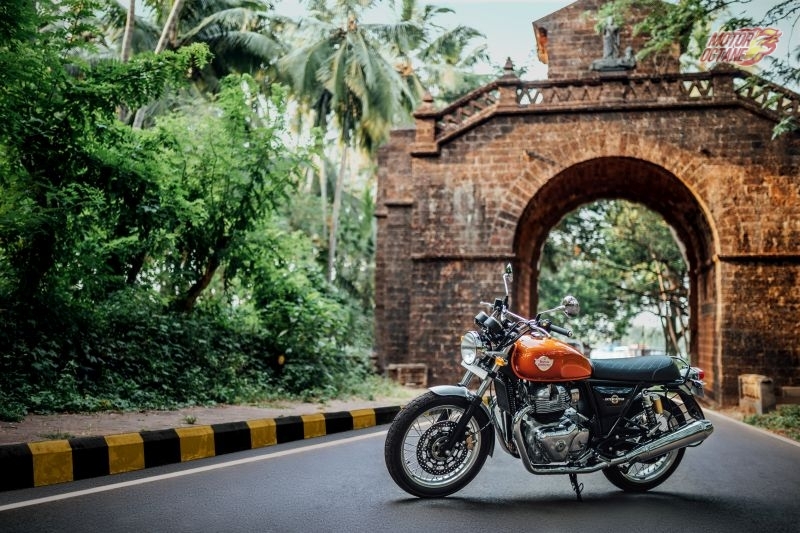 The Royal Enfield Interceptor brings the company into a new dynamic light. 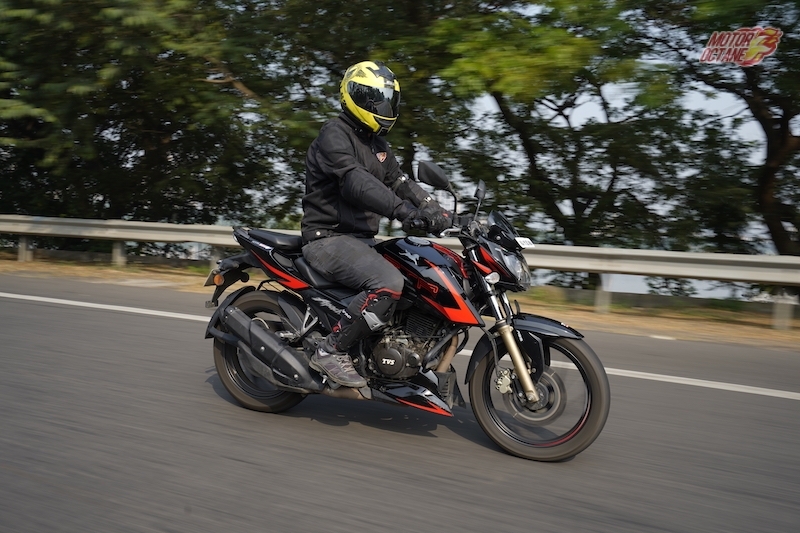 The bike comes with an air/oil cooled parallel 648cc engine which is a brilliant. The bike’s got the sticky Pirelli Phantom Sportcomp tyres which are brilliant for a spirited ride and the soundtrack from the twin exhausts minus the traditional thump is mind blowing. 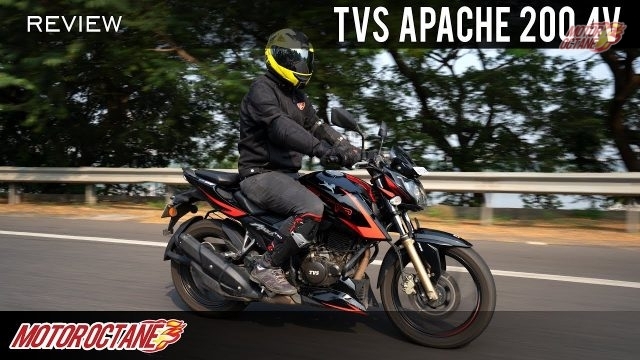 Below is our video for this amazing new bike that starts at a stunning price of Rs 2.50 lakhs. Take a look with our detailed video. The 3rd row dilemma is real. 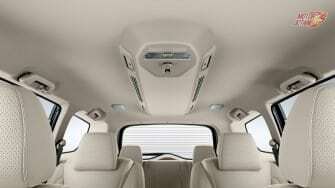 There are cars with great amount of headroom, legroom, thigh support and usable spaces. But there are few cars which can apply all of that in the last; extra row. Some of these cars are big SUVs. But let’s talk about the MUV segment which has seen the latest entrant in the form of the Mahindra Marazzo. 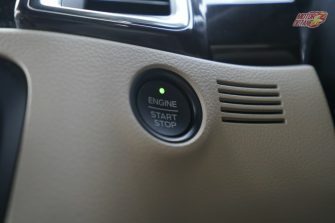 The car has entered a segment where adequate power, excellent ride and a certain amount of features are necessary for the customer to consider buying that car. 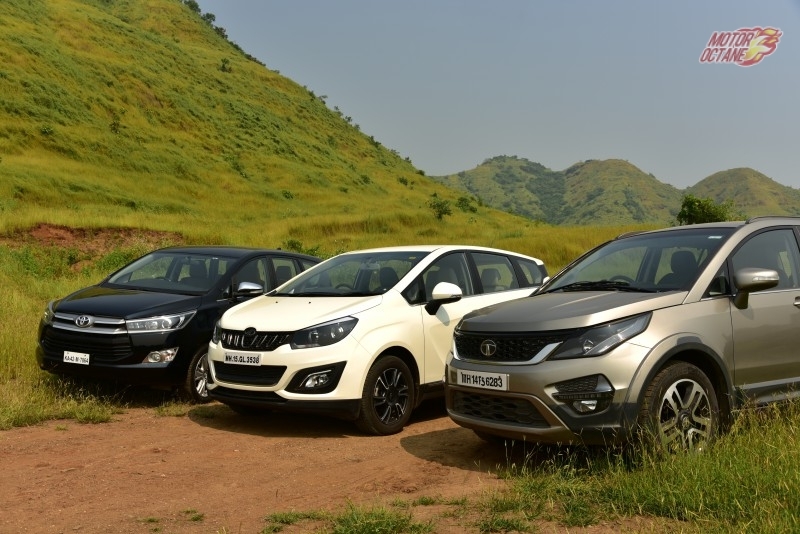 The Marazzo is going to battle directly with the Tata Hexa and the segment king, the Toyota Innova Crysta. 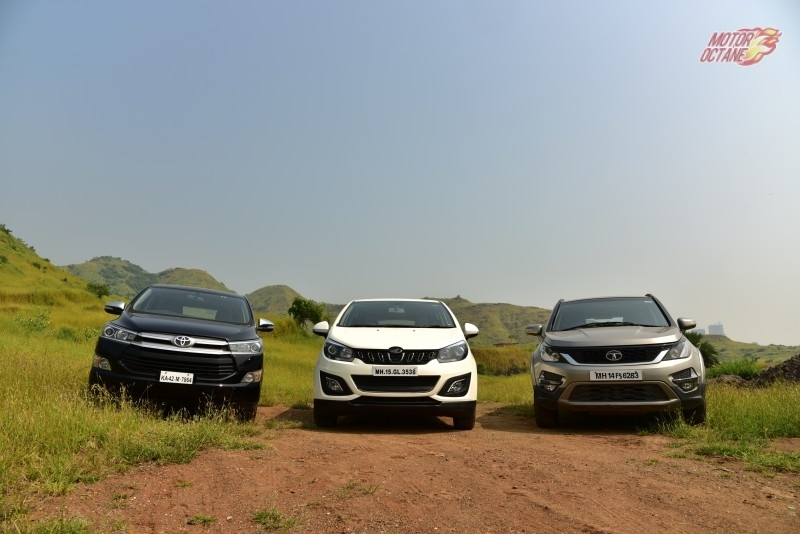 In this detailed comparison we find out which car among the three is best. This first comparison factor is price. And between these 3 cars, the price difference is substantial. The Marazzo starts at Rs 9.99 lakhs (ex-showroom) and goes up to Rs 13.9 lakhs for its top variant. The Tata Hexa starts from Rs 12.58 lakhs and goes up to Rs 17.99 lakhs. This is the only car in the segment to offer AWD/4WD. Next we come to the Innova Crysta. 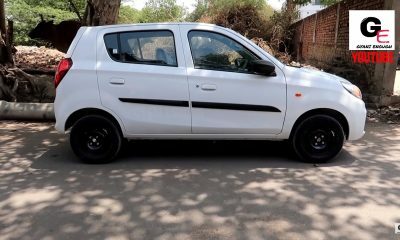 This is the only car in the segment which offers a petrol engine. The Toyota Innova Crysta starts at Rs 14.63 Lakhs and goes up to Rs 23.04 Lakhs. The petrol Innova Crysta price starts at Rs 14.63 Lakhs. The diesel Innova Crysta price starts at Rs 15.75 Lakhs. Check out the table below for a detailed breakdown of the individual cars variants. Design as we have always said is a very subjective matter. Let’s talk about the Marazzo first. The car is inspired from the animal kingdom’s shark. Its taillights, grille and shark fin antenna do the job of showcasing that detail. The car is a I must say has a great stance with the 16-inch alloys look great. The car with the most spot on stance is the Hexa. I’m not a fan of preposterously big wheels seen on concept cars but the Hexa’s 19-inch alloys had me say “Hello beautiful”. Lastly, we come to the Innova Crysta. The car is not a looker like the Hexa and the Marazzo. It’s simple, clean and carries a dignified air about it. All cars get daytime-running-LEDs and projector headlamps. The Marazzo even though is the smallest of the lot does seem to look part of the big MUV gang. But in all honesty, the Hexa with its big wheels and daunting stance is the best of the lot. Its glass area and body ratio is just correct. 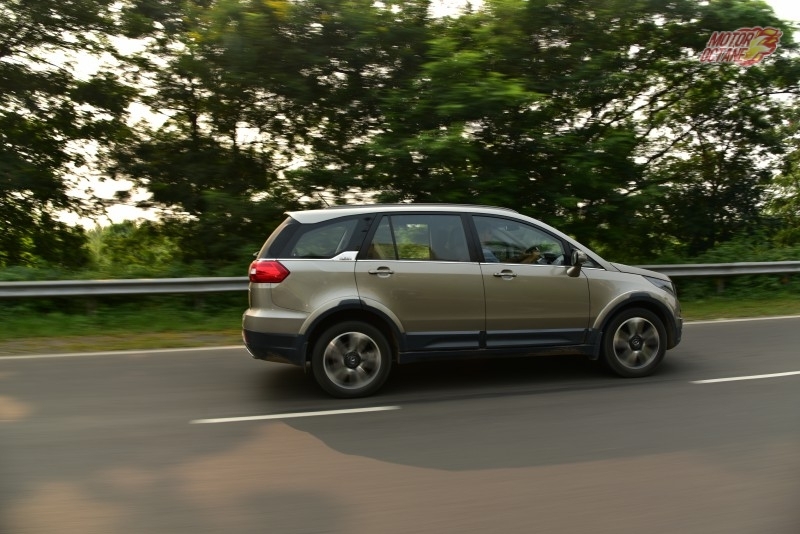 The design of the Tata Hexa just makes it stand out in the overall 7 seater segment. The part of car where we will spend most of our time. The car with the most amount of space. The most amount of comfort and utility is the clear winner in this comparison. Let’s start with the new kid on the block. Let’s get into the Mahindra Marazzo M8-top variant. The dashboard has a nice look to it. There is a big touchscreen that has all the entertainment options with Android Auto too. 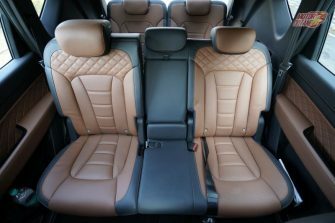 The seats in the front and back are very comfortable especially for long drives as they are on the firmer side of the cushioning. 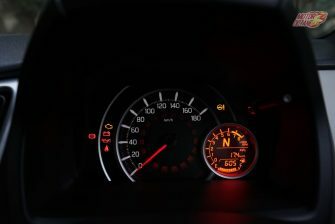 The instrument cluster with its purple accents is fresh and nice. If you see our detailed video below, even the last row is not bad. 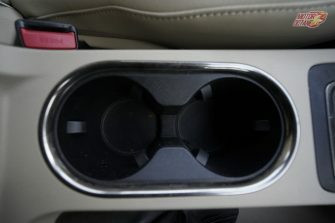 There are many smart storage spaces and there is a comfortable and very large storage unit in the center console which has cup holders and can be covered. And before we move on, we have to talk about this cars segment first feature which is its AC unit for the second and third row. Mahinda has introduced surround cooling with this car. The AC has normal blower system and an air dispersal system. Moving to the Innova Crysta, the comfort king. This car is really the industry benchmark when it comes to comfort but more on that later. 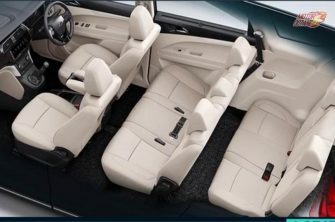 First, the equipment on offer in the Innova is substantially more and the space too. There are large door pockets, the storage under the armrest is sufficient too. The dashboard has a very neat and clean layout. There is almost every kind of display a driver would want or need. The ambient lighting on the rear AC vents look cool. Since we are considering the top variants of the respective cars with the Innova the second row is the most comfortable of the lot. 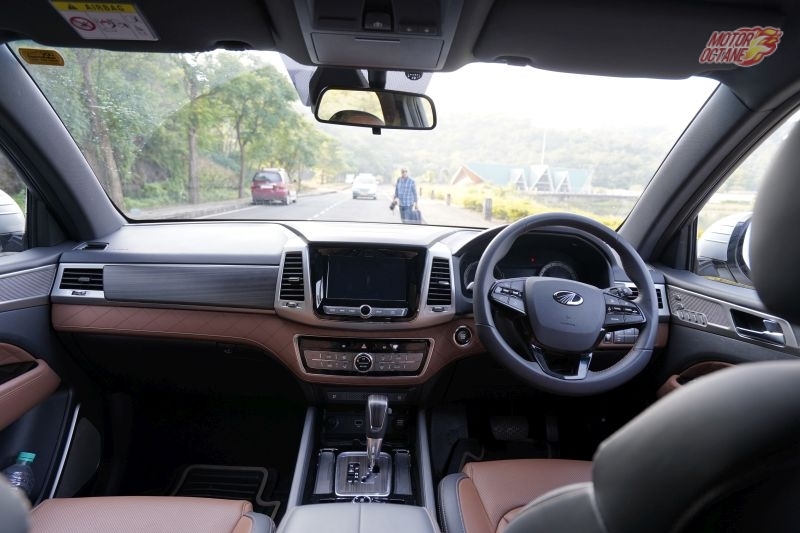 The front row, ergonomics, driver seat, driver visibility and position of the Tata Hexa is far superior. That all said the Innova’s third row is as good as and a little bit better than the Marazzo and way better than the Hexa. Coming to the Hexa lastly, it’s the biggest and heaviest here. You climb aboard this car and you are instantly the lord of all you survey. 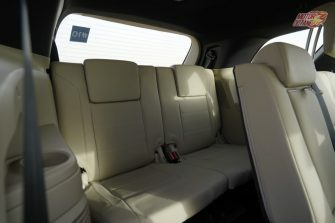 The drivers sits in a very commanding position with him so do the passengers in the second row which is just as tall. With the 19 inch tyres on the ladder frame body, this thing just dominates. Coming back to the interior, it’s a leather and plastic cocktail with a few hexa badges here and there. The infotainment screen is useless in its touch setting. Saving it’s grace is the banging JBL system with a sub-woofer on the boot door. 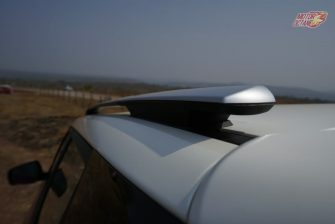 The car gets rear AC vents on the side pillers and the middle and cooling in the Hexa is quick. 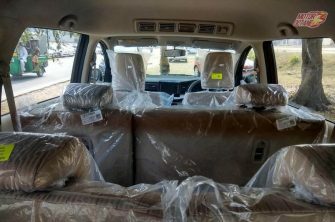 The car gets a lot of storage bins and the captain seats in the second row are very good but lack the support and comfort of the Innova. The third row is entirely not at all usable. It is good for short journey and children but nowhere as near as good like the Innova. The most important test of them all. Let’s again start with the Marazzo. This body-on-ladder MPV uses a transverse engine layout with front wheel drive. The 1.5-litre engine making 122bhp and 300Nm of torque paired to a six-speed gearbox is great. The car boasts the best NVH levels in the cabin and it’s true. While idling you hardly notice the engine and on the highway the noise from the road is the one that is more audible. The clutch is very soft and smooth, the acceleration is very liner and prompt with less lag than other cars in Mahindra’s stable especially with an accelerator pedal that has very short travel. The ride over bumpy roads is easy and fine. Potholes do tests its patience and it would be easier to navigate this car around them. The rest is fine. The steering is light. You will not be attacking corners in this car but attacking that gap in traffic will be a breeze. That said the car can change lanes and dart in the direction of your choice quite nimbly. It feels more compact than the other two cars here and going fast without the feeling of a heavy body results in a relaxed drive. 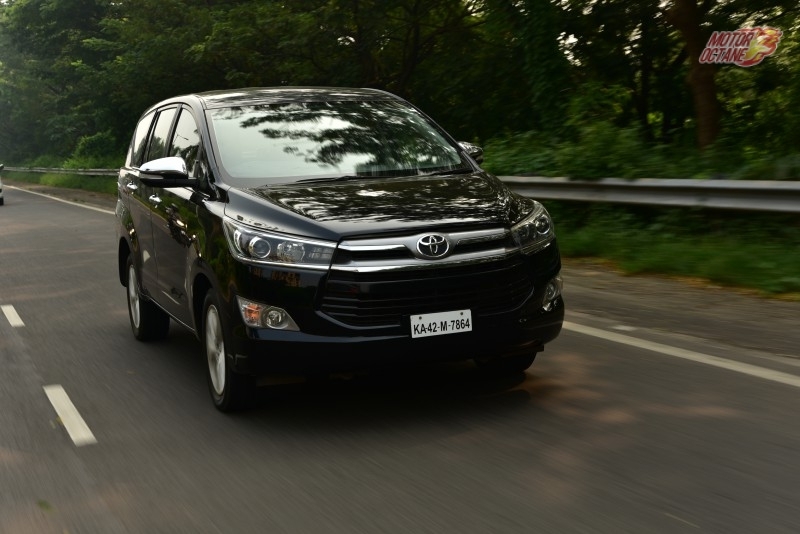 The Innova Crysta with it’s rear wheel drivetrain is better to drive. The power available on tap is more. The 172bhp of power with the 360Nm of torques to back it up makes a huge difference. The Innova has the power advantage for sure. The Marazzo does struggle at low rpm. The Innova can pull away on incline and hilly terrain using the might of it’s tall third gear. 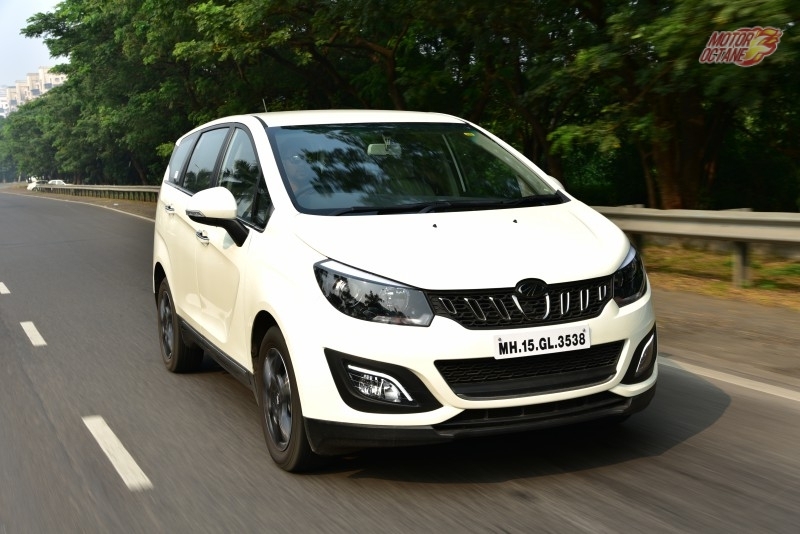 The Marazzo on the other hand as it happens to be with its tall 5th gear is a far more relaxed highway cruiser. The Innova’s handling is not as great as the Marazzo too. The Innova on bad roads does seem to be troubled more with body roll. That said, it can hit potholes and go through them with more confidence than the Marazzo. Last but not the least is the Tata Hexa. We have since this cars release taken it to various terrains and various environments or testing. The engine make 154bhp and 400Nm of twisting force, the 4×4 means more capability to go anywhere, the 19-inch tyres with a 235/60 section mean that most bumps and potholes are either flattened or quietly skipped over and at 200mm of ground clearance the broken roads or no existance roads is not a problem. The Hexa can do all of this while keep it’s occupants safe with 6 airbags and full comfort. The car reacts well to steering inputs and is not afraid to throw its weight in to a sweeping corner. 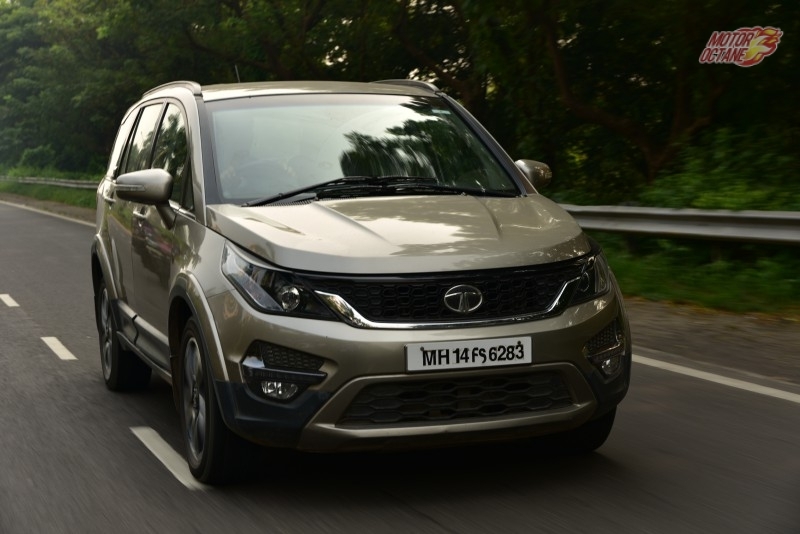 In the end I would only like to add one point that the Marazzo’s engine refinement is far better than the Hexa and the Innova. These cars have their own benefits, merits and high points. But it’s time to choose a definitive winner. So with price and all the other factors discussed above the winner of this comparison is the Tata Hexa. It’s right in the middle of both the other cars in terms of price. And actually gets more kit than the Mahindra Marazzo even if you take the XM or XMA variant where you will have to pay a little bit more and get almost all the feature plus an automatic gearbox. The Innova is a great car and if you budget extends till that price point there is no better car. 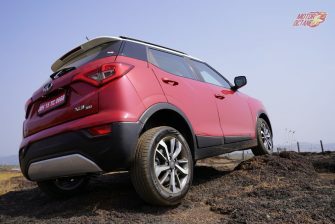 But if you are looking for the best capability and best value for money product, the Tata Hexa sweeps the floor with the other two.